Liquefied natural gas (LNG) is a commercially attractive phase of the commodity that facilitates the efficient handling and transportation of natural gas around the world. The LNG industry, using technologies proven over decades of development, continues to expand its markets, diversify its supply chains and increase its share of the global natural gas trade. 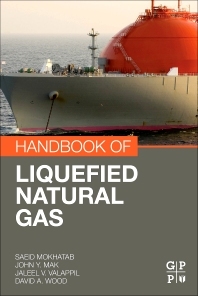 The Handbook of Liquefied Natural Gas is a timely book as the industry is currently developing new large sources of supply and the technologies have evolved in recent years to enable offshore infrastructure to develop and handle resources in more remote and harsher environments. It is the only book of its kind, covering the many aspects of the LNG supply chain from liquefaction to regasification by addressing the LNG industries’ fundamentals and markets, as well as detailed engineering and design principles. A unique, well-documented, and forward-thinking work, this reference book provides an ideal platform for scientists, engineers, and other professionals involved in the LNG industry to gain a better understanding of the key basic and advanced topics relevant to LNG projects in operation and/or in planning and development. Saeid Mokhatab is one of the most recognizable names in the natural gas community through his contributions to advancing the technologies in the natural gas processing industry. He has been actively involved in different aspects of several large-scale gas processing projects, from conceptual design through plant startup and operations support. He has presented on gas processing technologies worldwide and has published 300 technical papers and two renowned Elsevier’s handbooks in collaboration with leading experts from the largest international engineering companies and prominent process licensors. His numerous publications, which are widely read and highly respected, have set the technical standards in the natural gas processing industry and are considered by many as major references to be used for any gas processing/LNG project in development. He founded the world’s first peer-reviewed journal devoted to natural gas science and engineering (published by Elsevier, the United States) and has held editorial positions for many scientific journals/book publishing companies in the hydrocarbon processing industry. He has also served as a member of technical committees for several professional societies and acclaimed gas processing conferences worldwide. As a result of his outstanding work in the natural gas industry, he has received a number of international awards and medals, and his biography has been listed in highly prestigious directories. John Y. Mak is a Senior Fellow and Technical Director at Fluor, the United States, and leads the technology and design development for Fluor chemical and energy division. He is the technical expert and SME with Fluor for over 40 years and has been leading major oil and gas, petrochemical and refinery projects from conceptual designs, feasibility studies, FEED development, detailed engineering, to plant start-up and performance testing. John has made contributions to innovations in natural gas treating and processing, NGL recovery, LNG liquefaction and regasification, synthesis gas purification, and carbon capture methods. John is the co-author of the Handbook of Liquefied Natural Gas, first edition (2013) published by Elsevier, the United States. He has published over 80 technical papers and has frequently presented his findings at technical conferences such as GPA Midstream Convention, GPA Europe, Laurance Reid Gas Conditioning Conference, LNG Summit, Offshore Technology Conference, GASTECH, and China Coal Forum. John is the inventor of over 90 patents and patent pending processes. John is specializing in more complex NGL recovery designs for conventional and unconventional gases, treating high CO2 content gases using physical solvents, acid gas removal with amines, cryogenic nitrogen rejection and helium recovery. Jaleel V. Valappil is a senior engineering specialist with Bechtel Oil, Gas & Chemicals in Houston, TX, USA. He has several years of experience in process simulation, advanced process control and optimization of various processes including LNG. Before joining Bechtel, he was a senior consulting engineer with the Advanced Control Services Group of Aspen Technology Inc., where he was responsible for developing and implementing advanced control and optimization solutions for a variety of processes. He has worked extensively on developing and deploying process simulation models for applications in design, engineering, and operations of LNG plant built by Bechtel in collaboration with Conoco Phillips over the years. He identified the benefits of lifecycle modeling for LNG plants and its use for plant design, operability/controllability studies, startup simulations and Operator Training Simulators, multi-train LNG facility debottlenecking and operational troubleshooting. Dr. Valappil has also developed and deployed Advanced Process Control technology for LNG processes, for plants in engineering stage and plants that are already operating. He has published several papers on LNG plant simulation and control in both industry conferences and journals and holds patents related to LNG plant control and turbo-machinery operation. Dr. David Wood is currently an independent international consultant, researcher, training provider and expert witness with DWA Energy Limited. He has more than thirty-five years of international oil and gas experience spanning technical and commercial exploration and production operations, midstream and downstream project, risk and fiscal analysis, optimization, contract evaluation and senior corporate management. His early energy industry experience includes Phillips Petroleum, Amoco (Africa, Europe and UK), Lundin Oil (South America, Africa, Middle and Far East) and several smaller international companies. David earned a Ph.D. from Imperial College and worked as a post-doctoral research fellow in the Institute de Physique du Globe (France) and Birmingham University (U.K.).